So we have to cancel for this year, but next year we will start in February and then we will see! Make sure you mark your calendar 🙂 and remind us in January. Atado is looking forward to some interesting times and big plans! 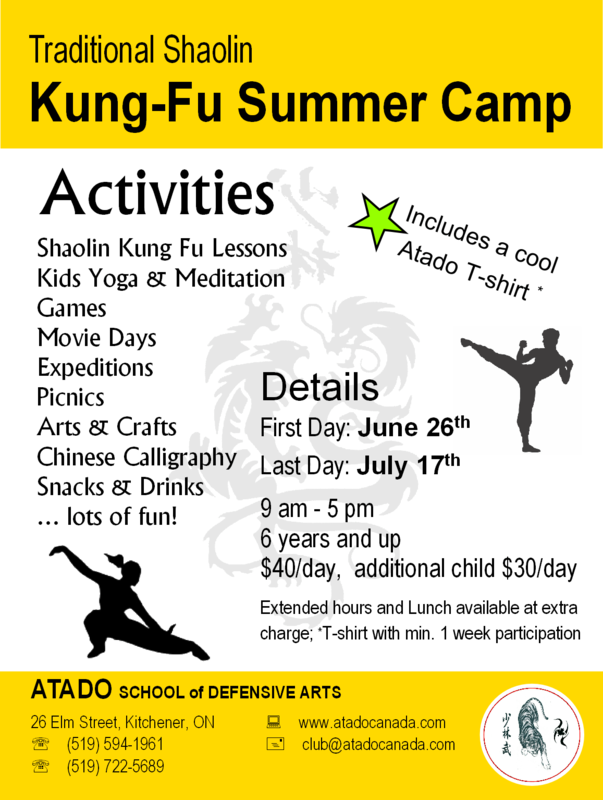 For a start, we are running a Traditional Shaolin KungFu Summer Camp in our club this summer. Come out and join us for three weeks full of KungFu, Meditation, Yoga, Arts & Crafts, Games, Movie Days, Picnics and lots of Fun! We start on June 26th on the first day of summer break. We will go until July 17th, assuming we get enough participation. So bring all your friends, too! Price will be $40 per day and $30 for each additional child. Talk to us if you need extended hours (outside of 9-5) and if you want us to provide lunch for your child. Groups will be supervised by our experienced instructors and at least one adult. Posted in Events, News and tagged Media.